We were down in Beaufort earlier in the week. They are now busily reconfiguring the roads so that backing into the ramps will not force you to cross a road. 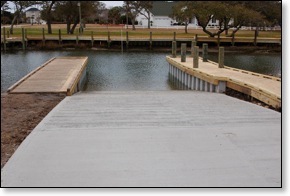 It looks like to me that these ramps are certainly going to improve water access in Carteret County. I hope we get something like that soon for the Wildlife Ramp in Cedar Point. It is overcrowded almost all summer. I sure the boaters down Beaufort way are glad to see this. In fact there are probably some boaters down our way that are glad to see this since some folks occasionally head up Beaufort way. Maybe this explains why there were so many boats on the water when we visited Beaufort. One of the things that you figure out over time is that every restaurant on the Crystal Coast has its own version of shrimp and grits. Since my wife loves grits and enjoys shrimp enough to eat them with grits, I have seen several different plates of shrimp and grits. I have even had to give up my dinner on occasion when a particular recipe was too spicy for my wife. 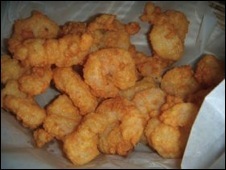 I love shrimp, and I have yet to see a dish that destroyed really good shrimp like we have here on the Crystal Coast. 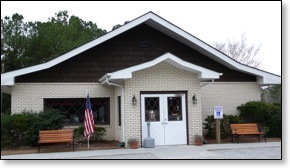 This weekend we were coming back from a visit to the Core Sound Museum on Harkers Island. We stopped by the Fish Town fish market in Beaufort for some shrimp. My wife had decided we were having shrimp and grits for dinner. All I could remember was the time back in 2006 when my oldest daughter and I cooked shrimp and grits for my wife for Mother’s Day. My memory told me that it was an all day procedure. When we got home, I started cleaning the shrimp, and quickly saw that the magic was actually a package of Southern Garlic Cheese Grits from Savor the Flavor of Sumter, SC. Our recipe ended up being very simple. After cooking your grits about twelve minutes take a pound or so of cleaned, deveined NC shrimpand saute them in olive oil with some chopped onions (green ones if you have them) for about three minutes. 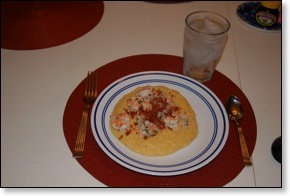 Spoon some grits on the plates, add shrimp, and some crumbled bacon for an extraordinary meal in minutes. The meal only took a minimal amount of magic. There is always excitement when a new eatery opens in the area. It is especially nice to get something new which is no already in the area. 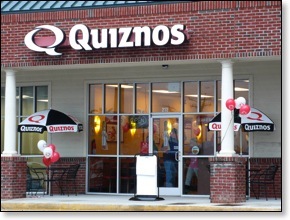 The Cape Carteret area does not have a lot of quick lunch places so getting a Quiznos should be a real help to hungry workers who need to eat quickly and get back to work. According to the sign they are opening Friday, March 27 at lunch. I am sure the place will be mobbed. I will wait a few days before trying it. There seemed to be a lot of activity at the shop today so it looks like they will be ready. While a good sub would be nice, I have had it on my mind that this about the time of year that the Crab Shack in Salter Path opens. We might just make our way down there and see if we can find some whole fried clams. We made our second trip to Harris Teeter in Morehead City today. A weekly ten dollar coupon will certainly get more than passing attention in this economy especially if you are in the area anyway. So far we have been impressed with the produce and with a couple of Angus NY strip steaks that we got last week. They were $5.95 a pound and came off the grill about as close to what we used to raise on the farm as anything that I have seen recently. Unfortunately I did not see any meat for the grill that caught my attention on our second visit. We did pick up a very tasty rotisserie chicken today for only $4.99. That is not bad since we get two meals out of a chicken. We have found some things that we cannot get in other places like my favorite Ruby Red Crystal Light and Green Mountain Gringo Salsa. The story is huge for our area, but certainly uncrowded at this point. We all know that we are grocery nirvana right now. Summer will soon be here, and we will be reduced to Monday through Thursday shopping except for small trips. I will not complain about the tourists coming since we all need them to keep our economy going. 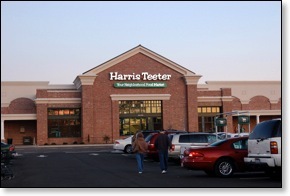 Harris Teeter is a nice addition to the area. We’ll certainly stop by occasionally and especially for the next two weeks since we have a couple more ten dollar coupons. 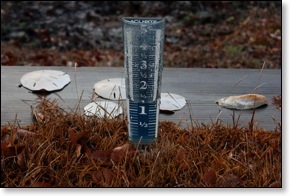 Yesterday was something of a rainy day here on the Carolina coast. That is a good thing since we needed the rain. The greater excitement and rain came well after dark. Sometime around 10:30 pm, we started hearing thunder which is sometimes hard to distinguish between the live mortars at Camp Lejeune. With the thunder came even more wind and finally rain which was heavy for a while. We got an inch in the night which made our total for the day 1.5 inches. That is a good start to some spring moisture. We have to keep those spring plants in good health. I am counting on fresh strawberries before the end of March. For a while we have been enjoying meals at Riso’s on Route 58 just before you get to Silver Creek Golf Course heading north. Recently we had the pleasure of eating there twice in a few days. One of my favorite meals is Pete’s Special which is meatballs and Italian sausage covered with tomato sauce and cheese and then baked and served with a side of spaghetti and a salad. It is a great meal and often there is enough left over for a second meal. I recently tried one of their Sausage Parmesan subs. It made a very nice lunch. On my last trip there I had the special which was Pete’s special with less meat and more pasta backed in the same dish. It is a little lighter than Pete’s special, but it does still come with the choice of a garden salad or a Caesar Salad. The interior of Riso’s has been redone. They are closed Sunday, but recently they have opened for lunch. Last I heard Riso’s was still taking reservations for Valentine’s Day. Unfortunately I know that I have a phone number for them, I just cannot find it. I will post one as soon as I can track it down. 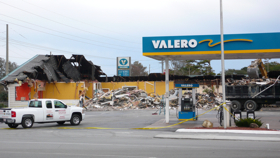 We were turned down Coast Guard Road for a visit to the point when we noticed that the Valero-Wine Mart that recently caught fire was being torn down. We headed on out to the point to capture a few pictures. When we came back, we stopped long enough to take a few shots of the excavator tearing down the burned out building. It was very efficient and quick. When we drove by the next day, there was nothing but bare ground visible. Based on what I have read in the newspaper, and how quickly the old building disappeared, it looks like they will have a new store as soon as possible. The recovery to our normal weather has hopefully started. It might be a bumpy start given there is a large east coast storm slated for early next week, but we have blue skies and warmer temperatures. We often go out in the afternoon to run errands. Emerald Isle is usually where we try to get our missions accomplished. If you have a choice, why not go to the post office at the beach or the grocery store at the beach. 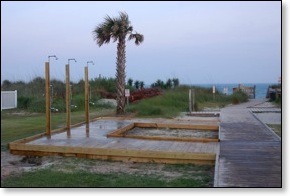 Of course taking advantage of Emerald Isle’s nice bike/walking trail is another good reason. When it is too cool for the beach as it was today, the bike trail is often warm enough to be very enjoyable. Before we went for our walk we drove down Cedar Street which is just across the road from Captain Willis Seafood. 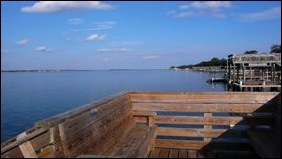 There is a small parking lot and a nice pier out into Bogue Sound. Today the sun was just right for sitting there and soaking up a few rays. It was a nice spot to be. There was no breeze, the sky was blue, and it was very peaceful. We might see cold temperatures again next week, but all I needed for my walk was a sweatshirt. I have to try to remember where I left my coat. One of the things you need to enjoy the water is a boat. In order to get the boat into the water, you need a boat ramp. It is always with great interest that we watch a new ramp show up or an older ramp get improved. In the last few months, Cape Carteret has really spruced up the town ramp on Manatee Street. My understanding is that if you are a resident of Carteret County, that you can apply for a permit, pay a fee and use the ramp. I have not been over to the town hall to ask, but I have been told that the fees are graduated depending on where you live in the county. The ramp also has a nice parking area for trailers and trucks. I expect it will be a lot more popular now that it has been fixed up. The sign by the ramp says that there is a $200 fine for using the ramp without a permit, I would make sure that I had the permit before my boat touched the water. Once again we managed to calculate our day so that we could be in the right spot to take some sunset shots. This time we were up the White Oak River visiting some friends in River Oaks Plantation. It is one of my favorite subdivisions. Everyone seems to really enjoy living there. 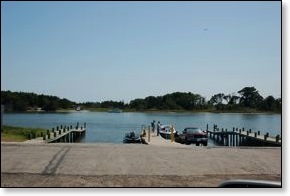 They have a nice dock with boat slips, and a serviceable boat ramp. Up in their section of the White Oak, they do not have to worry as much about oyster rocks as we do in the lower stretches of the White Oak. 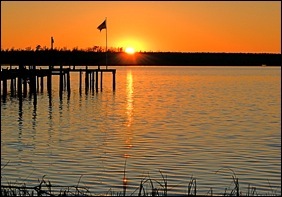 And of course they have the most fabulous winter sunsets of any spot on the river. There are also great live oaks scattered around their subdivision. Some are huge. It is a great community if you are looking for a place to enjoy the great out of doors and be a little off the beaten path.